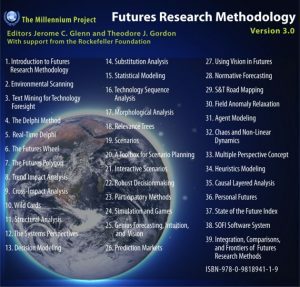 The largest, most comprehensive collection of internationally peer-reviewed handbook on methods and tools to explore future possibilities ever assembled in one resource. Over half of the chapters were written by the inventor of the method or by a significant contributor to the method’s evolution. The electronic download- contains 39 chapters totaling about 1,300 pages. Each method is treated in a separate file in word (.doc) and PDF format. The series begins with an introductory chapter to futures research and concludes with a synthesis of methods and speculation about the future of futures research methods. The other 37 chapters cover one specific method (e.g. Futures Wheel, Scenarios) or category of methods (e.g. Systems Perspectives, Normative Forecasting). speculation about future evolution of the method. Some also contain appendixes with applications, links to software, and sources for further information. Version 3.0 has not only added new chapters, it has also updated and improved the editing of the previous chapters making this version a significant improvement on the previous one.